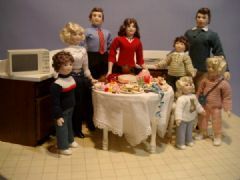 Welcome to the Woodside Dolls website. 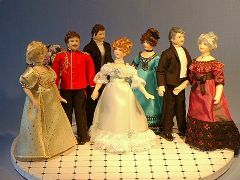 Here you will see some of the 1:12 scale porcelain dolls house dolls designed and hand-made by Jill and Caroline Nix. 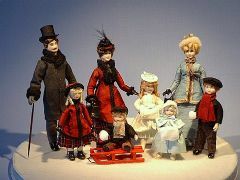 The dolls we supply by mail-order range in price from £20 to £40. 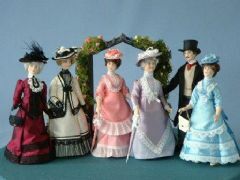 Existing collectors will also know we carry a 'value' range available only at dolls house fairs. We are happy to undertake commissions; call us with the details and we'll try to help you. 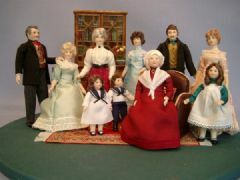 Collectors attending dolls house fairs in the UK will be familiar with the Woodside Dolls display. 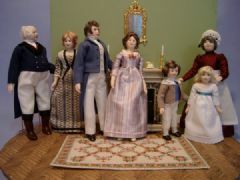 The dolls are set out in tableaux using some familiar props to create scenes which can be recreated in a dolls house. 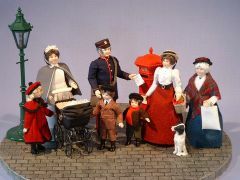 Different periods are displayed, from late Georgian, Victorian, through the 1950’s to Modern. 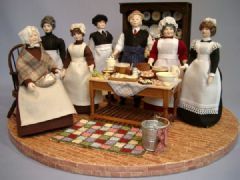 Please scroll down to find a selection of our most popular tableaux. 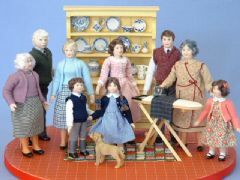 Click on any of these to see, or to order, any of the dolls currently in our range. To see larger images of each tableau, please click on the button 'Tableaux' at the top of the page.